There's a new article over on the Wired website yesterday that claims to prove a connection between the dozens tabs many people like to have open in their web browsers and an increase drain on the battery. I'm not so sure that this is true. Here is the plan. I am going to use one laptop and run a browser while opening tabs. Then I will use another computer to measure the power used by that laptop as a function of the number of open tabs. The Watts Up Pro along with Vernier’s Logger Pro does an awesome job of this measurement. The data wasn’t as clean as I thought it would be, but this still gives a general model for the power per tab. From this crappy data, I get a slope of around 0.19 Watts/tab for Safari and Chrome and around 0.16 watts/tab for Firefox. Even with the terrible data, I think it’s safe to say that more tabs means more power. For simplicity, let’s just say that it is about 0.18 watts per tab. Unfortunately their data doesn't appear to support this conclusion. Take a second and look at the chart of data included in the article. When you do, please ignore the lines that are plotted on the graph. Instead I want you to look at the data points. They represent the actual power usage measured during the test for the 3 web browsers tested (Firefox, Chrome, Safari). Do you see how green dots and the blue dots don't display a consistent behavior? As more tabs are opened they sometimes go down, and not up. That represents a drop in power usage as more tabs are opened, disproving the idea that more tabs equals more power usage. Curiously enough, the data does suggest that there is a relationship between having more tabs open in Safari and the amount of power used by the laptop. 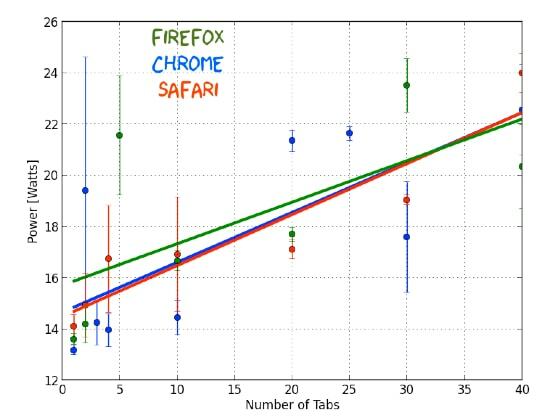 But it also shows that the extra power needed for the last 10 of 30 tabs isn't really that much of an increase. In other words closing those 10 tabs won't extend your battery life all that much. I would say it’s possible depending on how the browser handles background tabs (those tabs not in the primary window on display). If the browser allows each tab (or web page) to churn, refresh, run scripts concurrently, that is increasing CPU usage, thus battery usage. If the browser can somehow make these tabs, or web pages “sleep”, then no. I’m trying to decide what’s less sophisticated, this guy’s test methodology or your criticism. He showed an apparent connection between power consumption and the number of browser windows open on one device, but failed to account for about 30 other variables that are known to affect power consumption. Your criticism is wrong because we know that other things in the system will have an impact on power consumption. I would be a lot more suspicious if the graph displayed what you call “consistent behavior”. My criticism is that the data does not support the conclusion. That’s a minimalist critique, and I agree that I could have done more, but I don’t see what’s wrong with it.